After all the old ceiling boards were carefully removed (they will be re-used in the closet upgrade) it is time to start putting up the new boards. I replaced the can lights with LED lights on a timer with a dimmer. They are great night lights which cost nothing to operate. 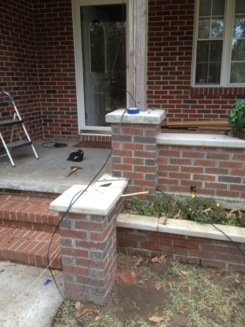 Naturally, I need to run power to the step columns for low voltage lighting for more lights. I am bit of a lighting freak for sure. 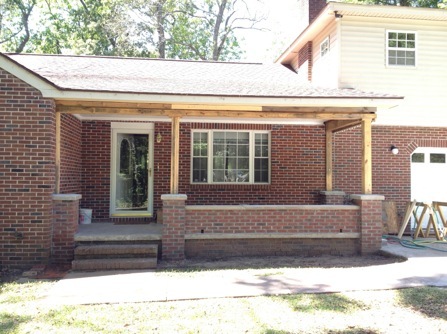 The big question is what am I going to do with the end of the porch. 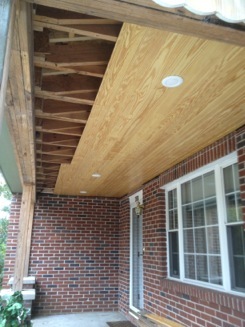 It has some really nice cedar wood under the paint. Hum, sand and varnish, paint or replace? 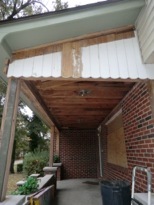 I have never liked my front porch. 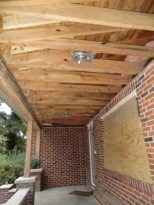 Before all the work started my porch was a typical one for the neighborhood. It had metal work holding up the roof on a plain slab of concrete. 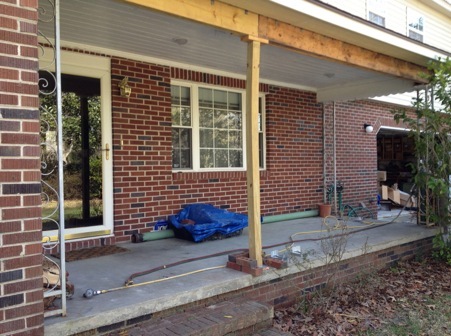 Upgrading the porch is on my house bucket list. Since there was a big sag in the middle and when I re-roofed the house I replaced the header beams and columns and decided to upgrade the entire look to one more appropriate for the age and character of the house. Replacing columns and header. 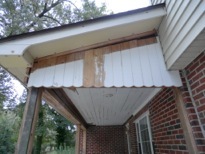 Remove old iron work (will be repurposed). First step is the ceiling. 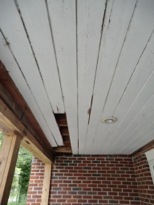 I agonized long and hard about the rot in the ceiling. I wanted to restore it to the original natural wood look (I painted it shortly after buying the house), but there is one problem….. The ceiling is made of red Cedar. Since I can not get any replacement cedar boards and I would have to lay on my back and sand the whole ceiling I decided the best coarse of action is to just replace it. 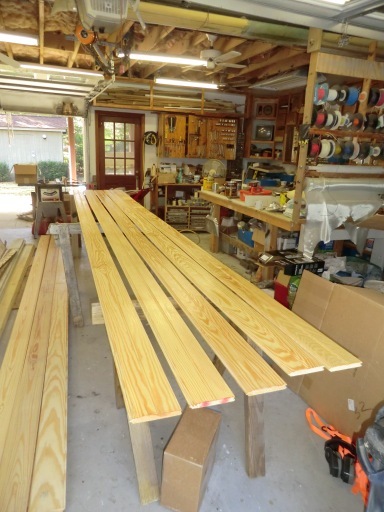 I decided to carefully remove and save the old cedar boards, plane and trim them and repurpose them for use in my closet. 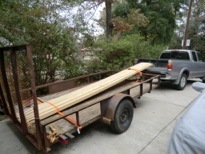 A quick trip to a specialty wood shop and buy some beaded pine. 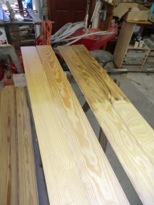 A couple of coats of semigloss poly and they are ready for installation.